What can you get for your money in Austin? Much of the news about the housing sector of the United States economy discusses inventory and sales activity in the “national market.” However, real estate is inherently a local business. Most people understand, without explanation, that comparing sales and sales prices in San Francisco to those in Kansas City or Dallas or Miami may be interesting. But it doesn’t really tell you anything useful about the health of any of those market areas. The fact is that real estate is actually “hyperlocal,” with sales and property values varying widely from one neighborhood to another within the same city, and from the central city to the suburbs. The Austin MLS segments listings and sales activity in dozens of “MLS Areas.” Those areas can be aggregated, which allows consideration of market status in larger, fairly logical, “MLS Regions.” I discuss historical property sales and values with clients frequently, and it is completely clear what a buyer wants and and is willing to pay for inevitably lead to decisions about location (or strong location preferences require realistic expectations about what is available within a given budget). The average size of single family homes sold in 2010 ranged from 1,570 to 3,171 square feet and average sale prices ran from a low of $132,741 to a maximum of $536,710. 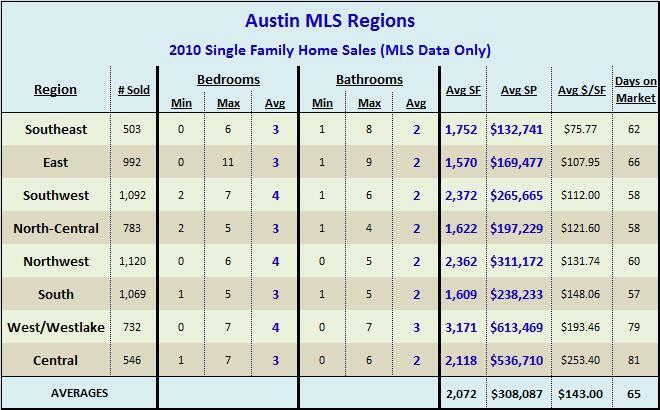 I am frequently asked about the “price per square foot” in Austin, and I suppose based on this data it would be accurate to give the simple answer of $143.00. How useful is that answer, though, when houses sold last year were valued from $75.77 to $253.40 per square foot? So … it’s fine to decide that you want a 4 bedroom, 2 1/2 bath home, with 2,500 to 3,000 square feet. It’s also great to love the convenience and the “vibe” of Central Austin. But it is not realistic to expect to match those objectives with a budget of $300,000. 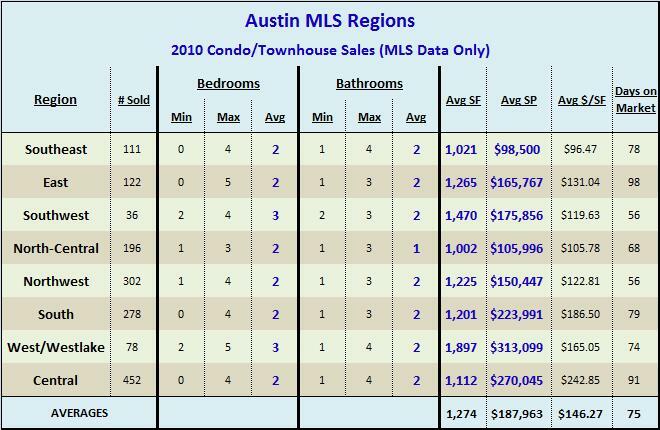 It is also perfectly within your prerogative to decide you want to live in a condominium in Southwest Austin as long as you understand that it could take a while: there were a grand total of 36 sold in that area in all of 2010. There are obviously many other factors that vary from location to location — age of home, style, access to public transportation, “walkability” to certain schools and employers, etc. 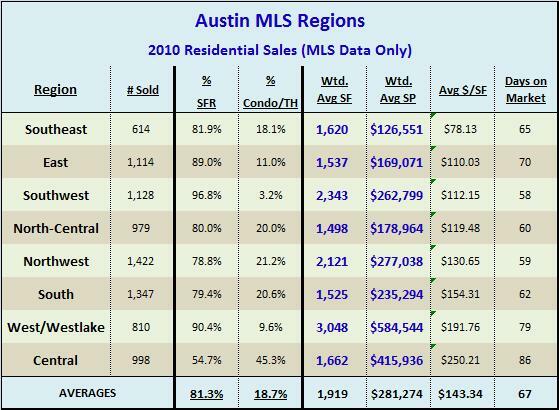 You will also find significant variability among neighborhoods, even within these MLS regions, but this data represents the “big picture” in Austin real estate. Sure, you may enjoy driving around every weekend looking at homes you like in the area where you want to live, but if they’re priced at twice your budget it’s just entertainment. Likewise, you can probably find a way to spend $500,000 on a home you love in the suburbs, but if everything around it is valued at $300,000 don’t be surprised if a profitable resale is difficult in a few years. These are all things that a prospective home buyer must take into account. Among many other roles, you should count on a real estate professional to help to calibrate your expectations. If your honest goal is to own a home, the search must begin on the basis of realism. I find that too many real estate agents are shy about having this conversation, but he or she owes you this counsel. Market knowledge isn’t your job; it’s your agent’s. Appreciate the MLS info here, thanks.